Karen found a pin for you on Pinterest! For as long as I can remember – at least since I began implementing servant leadership in the classroom to increase engagement – students have served as Discussant, Oracle, Colombo and Mr/s. Rogers. This semester, wanting to underscore activism, I changed the names of the roles to Perpetrator, Rescuer, Bystander and Survivor. Originally, perpetrate simply meant ‘to commit’. My goal is to inspire myself and others to commit to scholarship, compassion and transformation. A short description of each role (from the syllabus) is included at the end of this post. The purpose for this writing is to share what today’s Perpetrator invited us to consider and my response to her question. 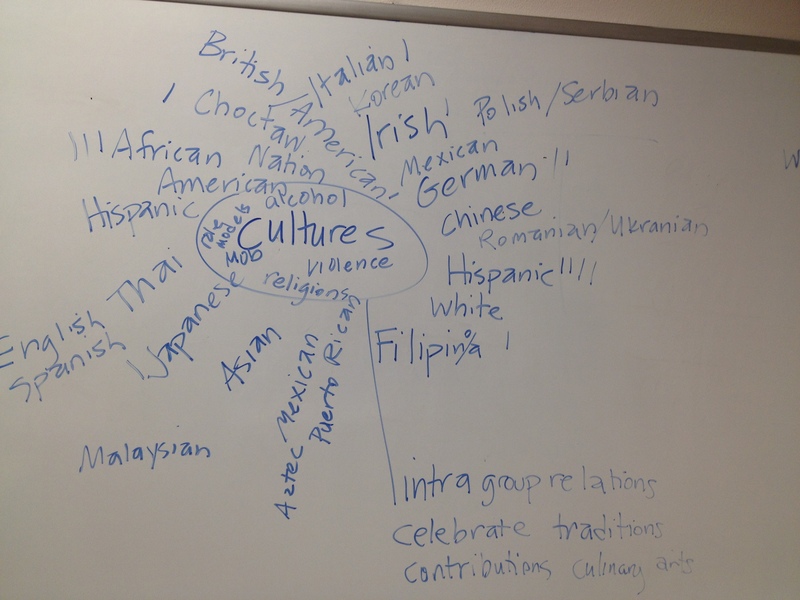 What do you expect to learn about the culture / background you identify with? Why is being a species-level thinker so important to me? First I should define what a species-level thinker is. A species-level thinker is one who knows who she is as well as who she might appear to be in various contexts from various Big 8 Little 4 perspectives, and continues to think about the whole and moving toward pro social ends using pro social means. It’s one thing to be a do-gooder but another to make a greater difference than sleeping with a clear conscience. Wrecked, by Jeff Goins, helps to clarify the distinction. I wonder if the Gipsy Kings-like music is distracting to others’ writing. So why is it that important to me that I and other educators unleash such initiative in the most effective and strategic ways possible? Because I believe life is beautiful and that the challenges we face as a species will require all of us to solve or take all of us out. We went on to discuss the identities people hoped to learn about and whether what we believe is as important as why we believe it. Perpetrator: Selects in-class writing & dyad (paired discussion) topics related to the assigned reading /activities for the week. Moderates class discussion. See Conversational Roles in Course Resources. Bystander: Summarizes daily activities and upcoming assignments 10 minutes before end of class. Opens Thursday class by following up on Tuesday’s Discovery & Intention while Perpetrator is writing topic on the board. Rescuer: Takes notes during class and posts to Service Notes discussion Board in Angel; collects week’s attendance, emails absent members. This prevents absentees from asking the instructor, what did I miss. Survivor: Serves as translator, time and peace-keeper to keep class on schedule. Observes class to identify random acts scholarship to be celebrated and muddy moments to be clarified. Reports before Bystander’s summary. Full of anticipation for Spring Break, I enter what I fantasize will be the last leg of the grading relay only to notice myself idly surfing the web about an hour after confirming an act of plagiarism in the first student’s paper. We are both only human. Having shifted directions psychologically, I am now running into the wind, instead of experiencing the tailwind I’d hoped for. Must soldier on. Why does it seem to take so much out of me every time this happens? Why do I persist in the notion that kids educated in Vegas get ethics lessons along with their Three Rs? This kid from the Bronx didn’t. While I recover, I jot notes for the first lecture in the Preparatory Composition class that begins after break, new swimming metaphor and all. I write this blog entry in lieu of feeding the hunger that is only 30% emotional, reactive. I call my husband who today is just around the corner, wondering if he’s up for lunch, beautiful day that it is, despite the internal and dispersing clouds.